Want to engage with the BBC, but unsure how to make your pitch successful? Whether you are the story, want to be the story or comment on a story, the feedback we received from BBC journalists, editors and producers was loud and clear; your content must have a broad appeal. Topical stories that divide opinion or spark debate are proving increasingly popular with BBC audiences, whilst quirky, snackable, and exclusive content which creates intrigue and entices users to click, will always rise to the top across all BBC platforms. 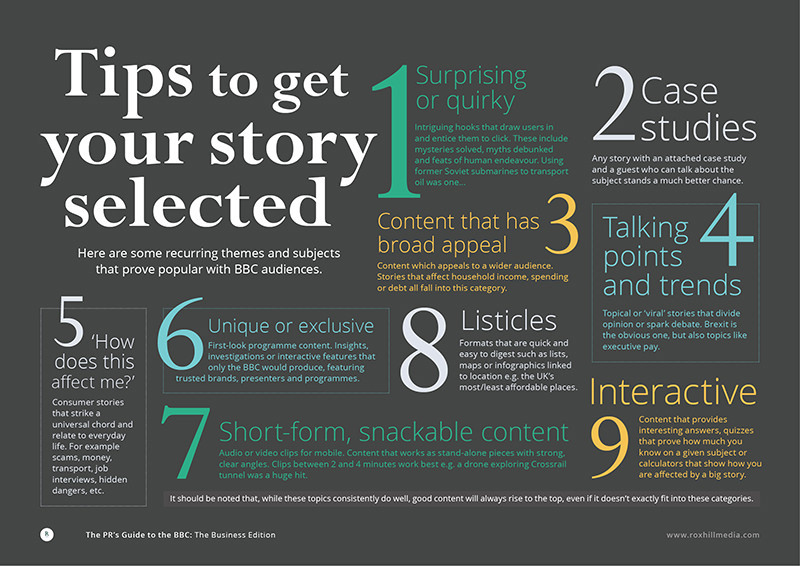 Our exclusive infographic offers 9 tips for getting your story selected by the BBC. This infographic was taken from our informative eBook: The PR’s Guide to the BBC: The Business Edition , covering how the BBC works across TV, radio and online. Get your complimentary copy today to ensure your next story is featured on BBC Business news. Roxhill Media is the real-time media intelligence platform. Founded in 2015 by Alex Northcott, the founder of the original Gorkana database. Roxhill’s topic-led media database allows businesses and PRs to effectively target journalists and news outlets around the world.